Two’s A Handful… Three’s Trouble! Dr. Ella Garvey’s eight-year-old twins loved to stir things up. 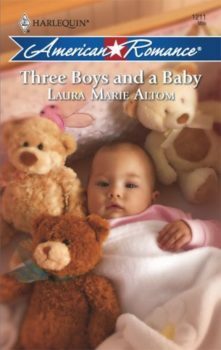 But when they hatched a daring plan with her neighbor’s son, Dillon, to keep a baby they’d found abandoned in the park, it was mischief times ten. The parents’ frantic search for the runaways caused the normally take-charge pediatrician not only to fall apart, but also to start falling for Jackson Tate, Dillon’s divorced dad. Ella wanted a fairy-tale ending. But then the firefighter’s ex arrived on the scene, and now Dillon expected his father to turn back the clock. Of course, Ella loved the idea of sharing three boys and a baby. But when it came to the man she wanted to marry, it was strictly hands off!